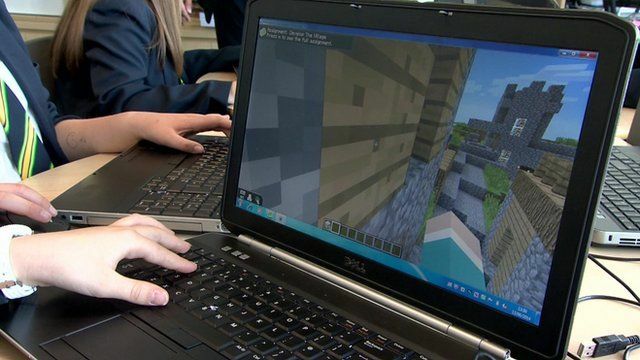 The schools using Minecraft in lessons Jump to media player Some schools are encouraging children to play computer games in lessons to help with more traditional subjects like creative writing in English. Children 'embarrassed' with books Jump to media player A study has found that nearly a fifth of children said they would be embarrassed if a friend saw them with a book. Library card plan to help boost literacy Jump to media player The Welsh government announces its latest attempt to boost literacy with a plan to give every primary school child in Wales a library card. Concern over UK key skills Jump to media player The literacy and numeracy skills of young people in parts of the UK are among the lowest in the developed world, according to a report. Madonna: Literacy 'basic human right' Jump to media player Madonna has told the BBC that she believes literacy is a basic human right. O'Dowd: Computer tests not mandatory Jump to media player The Education Minister, John O'Dowd, has said primary schools will not be required to use computer-based tests for literacy and numeracy this autumn. Should teachers use Minecraft in our classrooms? Computer games have been blamed in the past for causing violence and addiction, but now some schools are encouraging children to play them in lessons to help with more traditional subjects. So could "Angry Birds" help with trigonometry, or "The Sims" with social science? Tim Muffett has been to a school in Barnsley which is using Minecraft in its English lessons.